There will be a small heart-shaped void in Valentine’s Day this year, especially for those of you with a sweet tooth. SweetHearts candies, those ubiquitous sweets with simple messages of affection that are as much a Valentine’s Day staple as roses and chocolates, will be largely absent from store shelves this season. Alas, for the first time since 1866 freshly made SweetHearts with pithy little messages won’t be available. So be prepared this year to not see pink and purple KISS ME hearts in stores, office candy bowls, and school Valentine’s Day parties. While the occasional bag of SweetHearts can be found (leftovers from 2018), it won’t approach the typical avalanche of sweetness that accompanies this time of year. That’s because the New England Confectionery Company (NECCO), producers of SweetHearts as well as Mary Janes and Mint Julep chews, went out of business last May in the wake of repeated warnings from the Food and Drug Administration regarding food and safety. 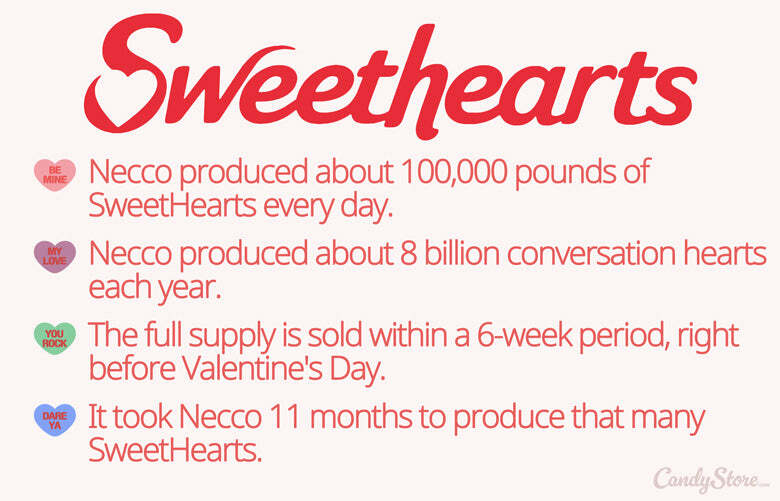 NECCO was eventually bought by the Spangler candy company, which makes dum-dums and candy canes. According to Spangler CEO and Chairman Kirk Vashaw, “Significant renovations have to happen … to bring it up to food grade standards,” while adding that “it’s just not possible” to make those changes in time to meet the demand for Valentine’s Day this year. But is there really that much demand for SweetHearts? Yes, according to CandyStore.com. Like in the billions. Which makes sense considering that candy sales and Valentine’s Day go hand in hand, to the tune of $1.8 billion in dollars spent by consumers on candy last year according to the National Retail Federation. Alas, for the first time since 1866 freshly made SweetHearts with their pithy little messages won’t be available. And Spangler won’t commit to having SweetHearts back on shelves en masse by 2020, so consumers may have to get used to another Valentine’s Day season without the classic candy. Which a SweetHeart message sums up best: MISS YOU.